Ambassadors from the Fayette County Chamber of Commerce recently welcomed the Fraternal Order of Eagles- Fayette Aerie #423 to the Chamber. 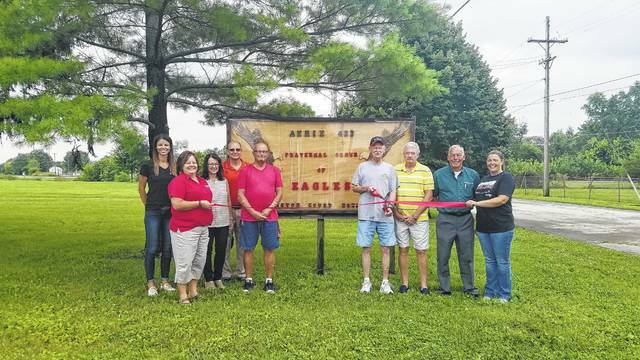 In a recent ribbon cutting ceremony, the Fraternal Order of Eagles- Fayette Aerie #423 was recently welcomed into the Fayette County Chamber of Commerce. The organization – whose mission is people helping people – has been in existence in Fayette County since 1903 and moved to its current location of 320 Sycamore St. in 1972. The 13 acres is home to their lodge and several ball diamonds which are used by the junior high baseball teams and the organization’s little league. The building recently went through a remodel and has more planned. With 320 members and 228 in the ladies auxiliary, the organization spends a lot of its time giving back to the community through scholarships, buying livestock at the county fair, and making donations to local charities. Donations only go to those entities that help persons in Fayette County. According to secretary Danny Coe, since 1998 the organization has given away over $396,000 to the community. Every Friday the Eagles offer a lunch buffet from 11 a.m.-2 p.m., which is open to the public. The menu changes regularly and the all you can eat meal is $9 per person. For more information about the Eagles or how you can become a member, call 740-335-9192.
https://www.recordherald.com/wp-content/uploads/sites/27/2017/07/web1_7.21.17-Eagles.jpgAmbassadors from the Fayette County Chamber of Commerce recently welcomed the Fraternal Order of Eagles- Fayette Aerie #423 to the Chamber.